So… last week, I was toying with the idea of a “Round Table” for beauty-related questions and answers and how it would be great for me on a selfish level to have somewhere that I could “shout out” the questions I receive via email when quite frankly I’m not always sure I have the best (or at least… “the only”) answers. I was originally going to introduce a ‘series’ where one post a week would include the questions that needed answering… but I figured it would be quite limiting for readers who may want to chime in with a question of their own from time to time. Mr. L suggested that I embed a forum into the site and when I realised that it didn’t have to be some mega-big affair, I decided that I would be game. The premise is simple (ish). I haven’t added a forum for chats and stuff… think of it simply as a deposit box for beauty-related queries that we can dip in and out of as and when relevant. If someone comes across one of my old posts on Google and has a question about a stockist for O.P.I polishes in the UK (for example) – rather than post on an old topic and only receive my reply… they can post it on The Round Table (or I can transfer it there myself) and they might benefit from 3 or 4 great suggestions from you fabulous guys. Does that make sense? Is it crapola? You can tell me… I always appreciate your honesty even if it sometimes me sulk for ages a short while. 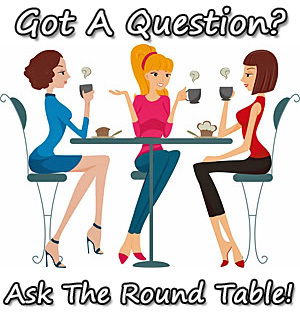 Anyway, if you wanna check it out or get the ball rolling and leave a question of your own (I’ll probably be ON every question until the novelty wears off ;)) then you can find a link to The Round Table in the top right or click here. Sounds like a great idea! I’m game! Such a great idea I love it!! Great idea, I ‘ll be definitely reading!